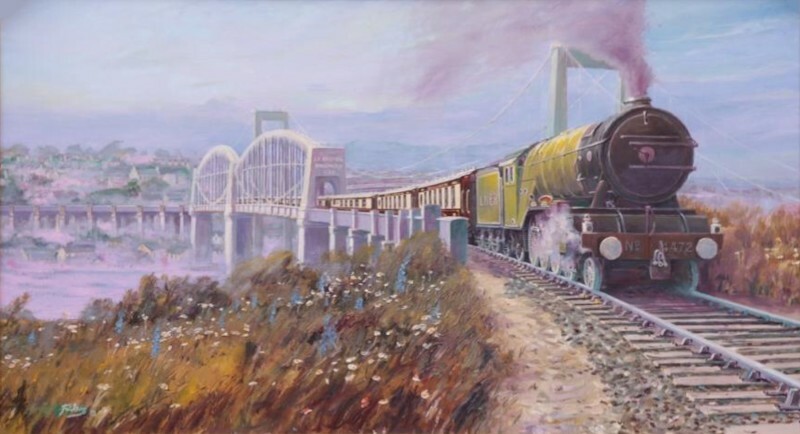 The location title is rather ‘tongue in cheek’, for those who haven’t spotted it immediately, our Flying Scotsman is shown here passing over one of the most famous bridges in all the British Isles, The Royal Albert Bridge, a masterpiece built by the even more famous engineer, I K Brunel. Minor ports like Saltash, Cornwall on the river Tamar were formerly places of some importance. Saltash was a stopping point for trade on the 35 km long navigable part of the river Tamar, a departure point for hinterland exports and a thriving place of ship and boat building. Formerly a ferry was maintained by royal warrant as a gateway to and from the ‘granite kingdom’ of Cornwall. I.K. Brunel widely considered one of the great engineers of all time designed and built in 1859 the then revolutionary now renowned Royal Albert Bridge for the Great Western Railway. Today Saltash is additionally bound by road to England by the Tamar Suspension bridge. The coming of rail and even more so of lorries and trucks ended the former way of life of Saltash port. This painting was created as a thank you for a friend who helped Gordon Frickers when no one else could or would. When pressed he asked for a picture of the world’s most famous steam engine, the Flying Scotsman with Pullman coaches and the Royal Albert Bridge. As far as we know the moment is fictitious, the Flying Scotsman being too heavy for the bridge. The location is real, all the details researched with Frickers usual meticulous attention including individual coaches and visits to the site. Credit where it is due: Special thanks to Jerry Sibley for the idea, inspiration and his practical help. 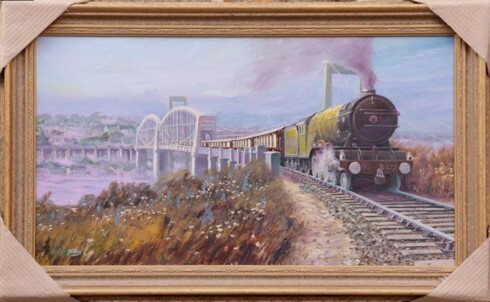 Gareth Mawdsley for photographs taken under Frickers directions on the track and to Ian Criddle of Plymouth Naval Reference Library also Mike Jeffries for a brutal but helpful critic of the Flying Scotsman which resulted in several significant improvements to the appearance of the Engine in this atmospheric painting. Further Reading, blog enteries: Useful facts + excellent stories about [CF7_get_post_var key='title'].